The historic town of Gjirokastra in southern Albania is a rare example of a well-preserved Ottoman town, built by farmers of large estates. The town is located in the Drinos river valley. The focal point of the town is the old citadel from the 13th century. The architecture is characterized by the construction of a type of tower house (Turkish (kule), characteristic of the Balkan region, of which Gjirokastra represents a series of outstanding examples. The City-museum of Gjirokastra is located in the south of Albania, in the Drinos river valley, not far from the Greek border. The region is amongst the richest heritage areas of Albania, covering a time span from pre-history to the Ottoman empire. From the 14th to 19th centuries, Gjirokastra developed from a small military post to a trading, administrative and residential centre of an agricultural region consisting of large estates. It occupies a central position on the western side of the Drinos valley, on the north-east slopes of the mountain Mali i Gjerë, which separates the valley from the Mediterranean region. The nominated area covers an irregularly formed site with a diameter of ca. 1km. The buffer zone extends some 200m further around the core zone. Today the town has some 25,000 inhabitants. The citadel (Kalaja) with the castle forms the focal point of the settlement. This fortification originated from the 13th century, when it was a feudal centre, later taking also residential functions, and it continued its function through the Ottoman period. In the early 19th century, it was enlarged and part of the old nucleus was rebuilt. The plan of the citadel is nearly 500m long and 50-100m wide, set along the elongated hilltop. The historic structures were built in stone with lime mortar, and are still standing though the site is ruined. It is crowned by a series of defence towers of different plan forms (rectangular, polygon and circular). There are three entrances: the oldest of these is from the north; the other two date from the enlargement phase in the 19th century. The citadel had underground reservoirs to store water provided by an aqueduct, which was some 10km long, one of the longest of the period. The development outside the citadel initiated in the 14th century with its best period in the 17th century. The residential quarters developed organically following the morphology of the rough and rocky terrain. In the centre, just north of the citadel, there is the market area, the Old Bazaar (Pazari i vjetër). It developed here at the beginning of the 17th century. It extends along four main streets that link it with the different parts of the city. At the beginning of the 19th century, it was seriously damaged by fire, and was subsequently rebuilt using the architectural forms of the period, though following medieval traditions in its structural system. The residential houses are marked by the emphasis of their verticality in the construction. The structure is entirely in stone, harmonizing well with the rocky landscape. The typology has its own particular character in the late medieval building tradition in Albania and the Balkan region. This house type is named Kullë (tower), and it is represented in a vast variety in Gjirokastra. It obtained its crystallization in the 17th century, but there are more elaborate examples dating from the early 19th century. The house has normally a tall basement, above which the first floor was for use in cold season, and the second floor for the warm season. In the interior, there are rich decorative details and painted floral patterns, particularly in the zones reserved for the reception of visitors. There are various structures dedicated to cult functions, which structurally follow the same pattern as the residential buildings. The Bazaar mosque in the centre of the city dates from 1757, and is formed of square plan surrounded by a portico on two sides. The church of Saint- Sotir, built in 1786, is a simple stone structure with three aisles each with an apse. The church of St. Michael, built in 1776 and rebuilt in 1833 after fire, is similar in structure. The historic city of Gjirokastra is the centre of the region of the Drinos river valley that has been called Dropolis taking the name from the Roman Hadrianopolis. A few kilometres east of Gjirokastra, there are the remains of the ancient city of Anigonea, founded by king Pyrrhus in 295BC. The region is characterised by a network of traditional cobbled lanes that linked this region to Greece in the south and central Albania in the north. In the villages of the valley there are 29 post-Byzantine churches and monasteries with important mural paintings, dating from the Ottoman period. The citadel of Gjirokastra was built in the second half of the 13th century as a feudal centre with military, administrative and economic functions in the region. The first phase of the castle was built on the south-eastern side of the fortification. 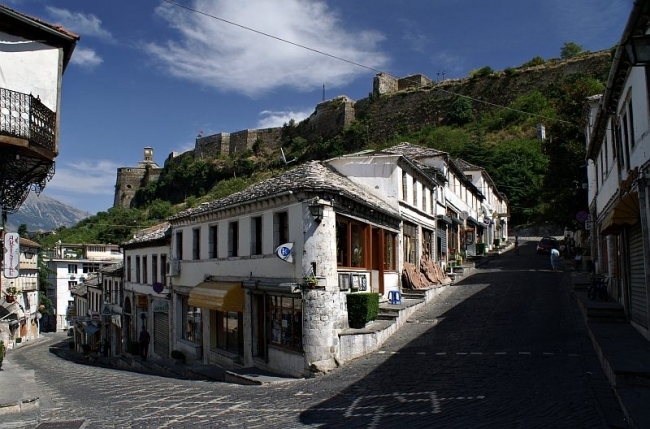 In the 14th century, the settlement extended outside the citadel area forming the town of Gjirokastra. In 1419 it was occupied by the Turks, who chose it as the centre of 175 Sandjak in Albania. In the 1430s, the town had some 163 houses. In the second half of the 15th century, it was the centre of Zenevis feuds. In subsequent centuries, the development was relatively gradual, and even though the town expanded, its basic character was retained intact, respecting the earlier constructions. In the 18th and 19th centuries, the builders however represented wealthier social classes and land owners, building more elaborate residences. The town grew around the fortified hill, which remained the central features. By the end of the 19th century, the fortification had lost its military function. In the 20th century, the city has not had any considerable constructions.